We’ve seen plenty of leaked pictures of the rumored to-be-coming GeForce GTX 670, but so far nothing definitive on the performance of the card. However, special thanks to some drama-rama between Nvidia and hardware review site TweakTown, TweakTown has leaked quite a comprehensive list of performance benchmarks on the upcoming graphics card giving us a very clear picture of what we could expect. Above we’ve got a GPU-Z screenshot from the new graphics card. As you can see, spec-wise the GTX 670 is quite similar to the GTX 680 with 2GB of GDDR5, a 256 bit bus width and 32 ROPs. However, it will come at clocked at a lower 915MHz (Boost 994MHz) and only 1355 Unified Shaders, down from 1536 Unified Shaders on the GTX 680. Other information about the card has been blocked out to protect the manufacturer who aided TweakTown in this leak. While TweakTown has quite a couple benchmarks up for you to take a look at, here’s a quick look at the 3D Mark 11 benchmark. As you can see, the GTX 670 performs quite similar (and ultimately defeats) AMD’s flagship Radeon HD7970 graphics card. 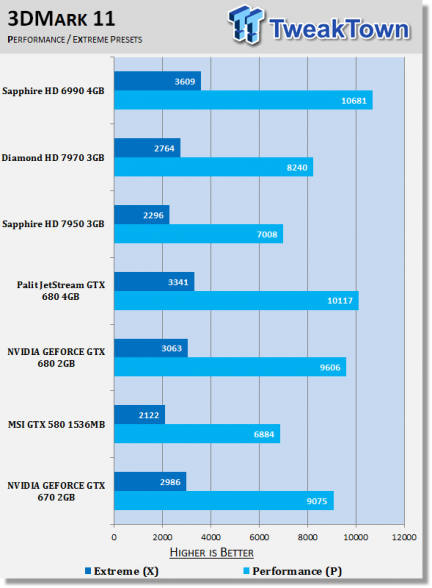 Most other benchmarks show a similar result as well with the GTX 670 defeating the Radeon HD 7970. Unfortunately pricing and availability is still unconfirmed at this time; however, if these benchmarks are accurate, the GTX 670 should be a beast of a graphics card to say the least. For more information, hop over to the link below! 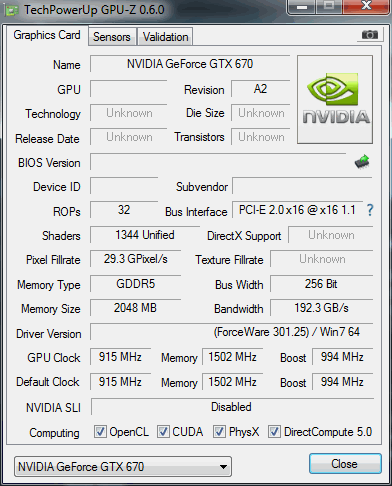 Edit: Overclocking performance has been posted over at TweakTown as well. Overall, it looks like the GTX 670 isn’t the best overclocker, but will ultimately be able to match or outperform the GTX 680 when overclocked. More information here.